A land whose name is no longer remembered, in a time no longer recalled. Five spinner rings, inlaid with crystals, and fashioned from precious metals and lodestone are sent out into the world by the Ancients, to be summoned by the presence of the one with the mark of a Quintspinner. 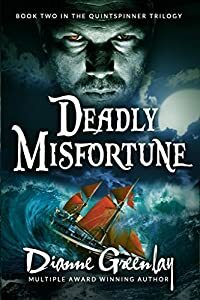 Tess Willoughby and William Taylor have lived through worse times: they didn’t drown in the shipwreck that brought them to this island, and they survived a harrowing escape from the hands of a vicious pirate crew. So far they have prevented anything from separating them. But now, one fall from a ledge in the darkness of a cave has done just that. Believing Tess to have died in the fall, and made reckless with his grief, William sets his sights on rescuing his friends from capture by a slave ship crew. Thinking William has come to harm and has been forced to abandon her, Tess struggles to engineer her own rescue from the cave, using the powers of the three strange rings that she has obtained. As she is driven to be reunited with William, however, Tess stands to lose all things that have a value beyond that of any possessions–love, family, trust, happiness, and even her life–for unbeknownst to her, the remaining rings have awoken and seek to design her destiny, throwing both Tess and William into the path of a psychotic killer.